Do you like the lore of Middle-Earth, but you're sick of the Fellowship? Have you had your fill of Frodo? Enough of Aragorn? Do you just wish Gimli would shut up about dwarfs? Snowblind Studios, the developer behind the PlayStation 2 version of Baldur's Gate and the Champions of Norrath series have got a game for you. The Lord of the Rings: War in the North focuses on events alluded to in Tolkein's books. Take control of a Ranger, Loremaster, or Champion, (man, elf, dwarf, go figure) and battle the evil descendant of the Black Númenóreans, Argen-*cough*-something-or-other. We'll call him Not-Sauron. You can team up with a friend in local or online play to battle Not-Sauron's forces. The game will feature upgradeable skills, a Mass Effect- style dialog system, and customizable characters. This new trailer has plenty of in-game footage, and it looks pretty darn good. 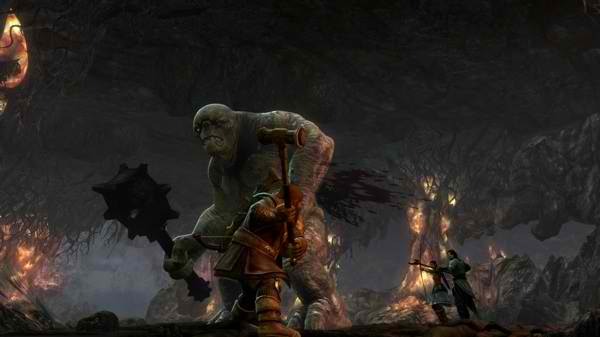 LOTR: War in the North is due out this year on the Xbox 360, PlayStation 3, and PC. Editor's Note: Not-Sauron's name is Agandaûr. Listen to the trailer. Did you hear Agandaûr? No, You didn't. Silly made up words. Page created in 0.3108 seconds.